Pasquale Natuzzi, Chairman & CEO of the Natuzzi Group, has been honoured with the special prize “2015 Italian Talent Award” for MADE IN ITALY 2015 by the Italian Talent Association. The initiative - sponsored by the Premiership, the Senate, Chamber of Deputies, Ministry of Industry, Ministry of Agriculture and Forestry, Ministry of Health and the Institute for Foreign Trade – is dedicated to journalists and “excellence” promoting the Made in Italy in the world. 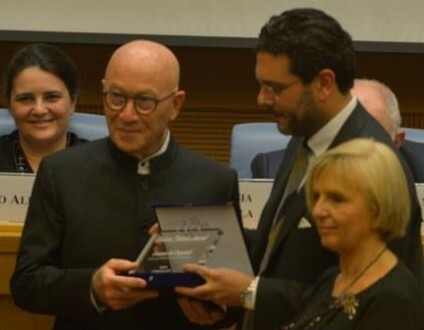 The awards ceremony took place in Rome, at the Chamber of Deputies, in the presence of the President of the Senate Pietro Grasso, the Vice President of the Chamber of Deputies Marina Sereni, the Minister of Health Beatrice Lorenzin and other Government’s representatives. Pasquale Natuzzi has received the Special Prize for the Made in Italy, as a representative of Italian excellence in furniture and design, example of creativity and innovation appreciated worldwide. “Receiving this award as a special excellence of Made in Italy is a source of pride, but also of responsibility,” said Pasquale Natuzzi. ” Every day we export the soul of our beautiful country in the world through our products. Made in Italy is the unique and unrepeatable result of our culture, art, beauty of our landscapes. I dedicate this award to our region Puglia that has been placed among the most beautiful regions in the world from the National Geographic. A masterpiece of nature and talented people, a land to which we will always be grateful”. In addition to Pasquale Natuzzi, who was awarded for design and innovation, the “Italian Talent Awards” were given also to Mr. Oscar Farinetti, Founder of the international chain of wine shops Eataly; Ms. Lidia Bastianich, Italian born American celebrity chef, television host, author, and restaurateur; Bruno Serato, chef owner of the Italian restaurant “Anaheim Withe House” in the South of Los Angeles, posted by CNN in the top ten of the heroes of the year, because feeding 700 poor children a day.